Well… it’s been quite a 2018 in the fantasy world of RPA (RPA plus RDA), where some of the fantasy dollars have magically become real, as the market hit $1.7bn – an increase of $250m from our forecast last year. So when the more conservative of forecasters (HFS) undershoots the market by 17%, you know RPA has been sneaking down the growth hormones of late. Example use-case: automating invoice processing across multiple business applications handling rule-based exceptions. RPA is different from traditional automation software as it is inherently capable of recognizing and adapting to deviations in data or exceptions when confronted by large volumes of data. In effect, it can be intelligently trained to analyze large amounts of data from software processes and translate them to triggers for new actions, responses, and communication with other systems. RPA describes a software development toolkit that allows non-engineers to quickly create software robots (known commonly as “bots”) to automate rules-driven business processes. At the core, an RPA system imitates human interventions that interact with internal IT systems. It is a non-invasive application that requires minimum integration with the existing IT setup; delivering productivity by replacing human effort to complete the task. Any company which has labor-intensive processes, where people are performing high-volume, highly transactional process functions, will boost their capabilities and save money and time with robotic process automation. Much fr RPA is self-triggered (bots pass tasks to humans), but requires human intervention for judgment-intensive tasks and robust human governance and to make changes / improvements. Example use-case: automating transfer of data from one system to another. RDA is essentially surface automation, where desktop screens (whether desktop-based, web-based, cloud-based) are “scraped”, scripted and re-programmed to create the automation of data across systems. A well-designed RDA solution can automate workflows on several levels, specifically: application layer; storage layer; OS layer and network layer. Workflow automation on these layers requires equally specific technologies but provides advantages of efficiency, reliability, performance and responsiveness. Much of this automation needs to be attended by humans as the automation is triggered by humans(humans pass tasks to bots), as data inputs are not always predictable or uniform, but adaptation of smart Machine Learning techniques can reduce the amount of human attendance over time and improve the intelligence of these automated processes. Similarly to RPA, RDA requires human intervention for judgment-intensive tasks and robust human governance and to make changes / improvements. However which way we spin “digital”, the name of the game is about enterprises responding to customer needs as and when they occur, and these customers are increasingly wanting to interact with companies without physical interaction. Moreover, the onus is moving to the most successful digital enterprises being able to anticipate the needs of their customers even before they occur, by accessing data outside of the enterprise across the supply chain, or economic and market data that can help predict changes in the market, or emerging offering that customers will want to purchase. In short, every siloed dataset restricts the analytical insight that makes process owners strategic contributors to the business. You can’t create value – or transform a business operation – without converged, real-time data. 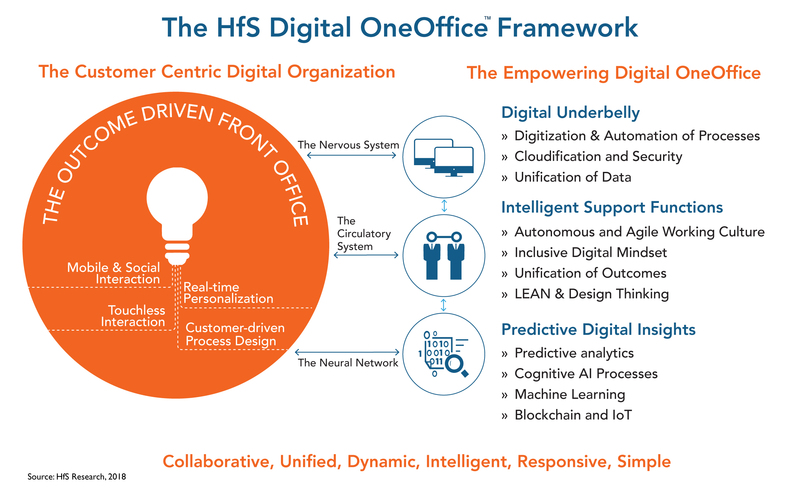 Digitally-driven organizations must create a Digital Underbelly to support the front office by automating manual processes, digitizing manual documents to create converged datasets, and embracing the cloud in a way that enables genuine scalability and security for a digital organization. Organizations simply cannot be effective with a digital strategy without automating processes intelligently – forget all the hype around robotics and jobs going away, this is about making processes run digitally so smart organizations can grow their digital businesses and create new work and opportunities. This is where RPA and RDA adds most value today… however, as more processes become digitized, the more value we can glean from cognitive applications that feed off data patterns to help orchestrate more intelligent, broader process chains that link the front to the back office. In our view, as these solutions mature, we’ll see a real convergence of analytics, RPA and cognitive solutions as intelligent data orchestration becomes the true lifeblood – and currency – for organizations.